There’s a funny thing that happens when you do lots of crafting/creating. You start to look at items around you in a new way. For instance, I looked at the tops of my son’s fruit squeezes and saw jetpack nozzles! So I decided that I NEEDED to build a steampunk jetpack for Logan. The first thing that I do when beginning a project like this is look for inspiration photos. I rarely try to make something look exactly like an inspiration photo, but instead use the photos to help me get clarity on what I want my finished project to look like. I knew that in addition to my nozzles, I was going to need tubes for the sides, something to make up the main body of the jetpack, at least one gauge, some embellishments and straps. For the tubes, I chose some dollar store bubbles and cut the wands out of the caps and cut off the little star and heart that were on the top of the caps. I then sanded the caps so they were flat on top. For the gauge, I used a compass ring from the dollar store. I took the clear plastic top off and took the needle and the paper with the compass printed on it out. Then I cut off the ring portion. I measured the compass insert, found a cool image of a vintage gauge face online and printed it out so it was the same size. For the body, I cut a piece of 3/4 inch wide styrofoam so it was just slightly shorter than the tubes and a couple of inches wide. I cut a piece of 2mm craft foam so that it would wrap all the way around the styrofoam. I cut several narrow strips of craft foam for the bands that wrap around the tubes and the jetpack. Then I spray painted everything black. For the embellishments, I used some plastic beads and brads to make the knobs and the top of an essential oil bottle (where one of the hoses connects) and weed trimmer cord for hoses. The little “glass” tube on the front was made with a piece of thin plastic and craft foam. The green liquid is white glue with food coloring added. I used small eyelets to create the places that the hose entered the tubes and the vial. Once everything was in place, I used Rub N’ Buff in a variety of colours to make the pieces look like metal. The final piece was the straps. I cut a set of waist straps out of leather, attached a bronze buckle to one end, and made holes in the other side so the strap could be buckled. Then I cut two shoulder straps so they were long enough to reach the waist strap and attached them with rivets. Then I cut a set of chest straps, added a buckle and attached them to the shoulder straps with rivets. Now I had a jetpack but what was Logan going to wear?? The first thing I made for him was the aviator hat. I’ve been wanting to make one of these for a while too. I drafted a pattern, did a couple of tests and then made it out of faux shearling. I added leather straps and a buckle closure. The side details are made out of craft foam and coconut milk lids. These were also painted black and then had Rub N’ Buff applied to them. The goggles were made using my Steampunk Inventor pattern. Next up, the shirt. I didn’t want to completely reinvent the wheel but I wanted something that looked fairly close to a Victorian work shirt. So I modified my Steampunk Pirate Shirt. I changed the centre fronts so they overlapped and added a faux placket with top-stitching. Instead of gathering the bottom parts of the shirt where they attach to the yoke, I made little pleats in both the front and back pieces. I narrowed the sleeves so they weren’t gathered into the cuffs. Lastly, I drafted a mandarin collar to fit the shirt with little tabs that fold down in the front and then sewed on tiny brown buttons. I wanted to make Jodphur pants for Logan with a front fall closure. I pretty much had to draft these from scratch. I used hot fix studs as faux buttons on the front fall and on the bottom outsides of the pant legs. Lastly, I wanted to make a really cool looking vest for him. I used the Steampunk Pirate First Mate vest as a jumping off point. I cut it down and drafted a decorative piece to add to the front. I used brads with copper/gold coloured pearls on them in place of buttons. For footwear, I borrowed a pair of steampunk boots that I had made previously for the girls. 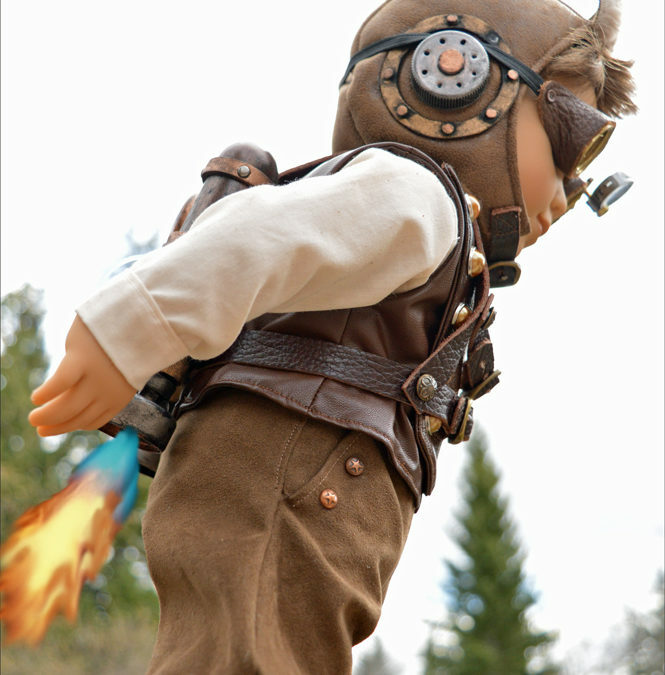 The final step was taking pics and adding jetpack flames in photoshop! I hope you enjoyed this project post. I sure enjoyed making this outfit. I’m toying with the idea of doing a ‘making of’ video in the future because I want to make another jetpack. Is that something you’d like to see? Let me know in the comments. Spectacular! So many neat little changes to patterns you already provide, and inventive recycling of common enough objects … but mostly a lively imagination, an opportunistic nature, and considerable artistic skill. Such a pleasure to look upon, thank you! Yes, of course I’d love to watch a video! I just finished making this while following the videos. Watch them on Youtube on Kelibu’s channel. Fantastic project. Can’t wait to see a picture!